The reason I haven't been blogging for some time, is this robot I built with the GarageGeeks guys. 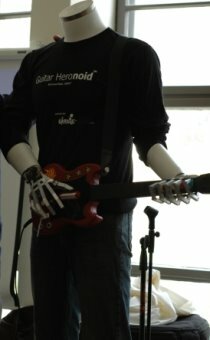 Bringing our image processing and visual attention skills from http://www.Feng-GUI.com to the brain of the GuitarHeroNoid, a robot who play the PlayStation GuitarHero game. Guitar HeroNoid first live show at KinnerNet2007 dining room.